AILA also asked Andres to serve a third year as a member of the amicus curiae committee, the committee that decides which cases AILA will support with amicus briefs and prepares briefs on behalf of the organization. In 2013-14, the committee submitted sixty briefs. Dree was chosen again to serve as the Chair of the AILA asylum committee. Thomas Ragland will continue to serve on the Federal Court Section Steering Committee. We are now faced with a humanitarian crisis at our borders. CBP and ICE officers are using excessive force, inhumane detention conditions, and “no process” removals. We are faced with immigration courts fighting against insufficient resources, overcrowded dockets and cabined legal discretion. And we are faced with a renewed assault on our asylum system by Congress and the agencies themselves. Yet, no actions are taken by those in power to fix our system. Instead we have a Congress that points fingers and strikes a pose in Capitol Hill hearings and an Administration which, on the back of an immigration reform-focused campaign, has taken to putting Band-Aids on gashes rather than treating the underlying wounds. Until we have leaders who are going to work together to solve real problems that affect real people, American businesses, and separated families, it is up to us. It is for these reasons that this award is only the beginning of my journey. After the awards ceremony, BR and many FOBRs headed out for a night of dancing, before getting back to the work that we knew awaited us. 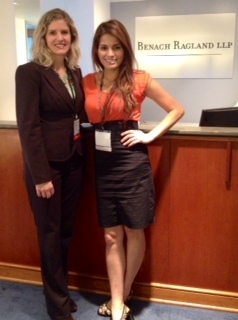 It has been a busy and exciting few weeks at Benach Ragland. From immigration reform rallies to dramatic courtroom victories, BR has had a month to remember. Starting off, courtroom victories are the reason we do what we do. Three major courtroom victories this month have lifted everyone’s spirits. First, Andres Benach presented seven hours of testimony and 747 pages of documentary evidence to the immigration court in Pennsylvania over two days in winning a 212(h) waiver for a permanent resident convicted of an aggravated felony. Legally, this victory was only made possible as Circuit Courts around the country, including the one in Pennsylvania, have decided that the plain language of INA 212(h) allows certain permanent residents convicted of aggravated felonies to seek the waiver. This was an unheard of notion about five years ago when the U.S. Circuit Court of Appeals for the Fifth Circuit in Texas decided the case of Martinez v. Mukasey that opened this door. At the time, we told our client that his only hope was that the logic of Martinez would also be accepted in the Third Circuit, where he was facing removal proceedings. In September, a decision called Hanif v. Attorney General did just that and we were able to put on the case. Overcoming the aggravated felony, showing the Judge that the family would suffer extreme hardship without the husband/ father and demonstrating that our client deserved this second chance took every bit of energy and evidence we could muster. When the Judge finally ruled, the entire family broke down in tears relieved that the threat of deportation had been eliminated. Second, Dree Collopy wrapped up a long and emotional saga when her client was granted adjustment of status without a whisper of opposition from DHS. After years of fighting DHS on the case, Dree overwhelmed the government with evidence and reason, such that DHS agreed to her client’s adjustment. Dree’s client, Sophie, is BR’s May 2013 Client of the Month and you can read more about her here. Finally, Thomas Ragland was hired on Thursday, worked all weekend, and destroyed the government’s case on Tuesday. A case that had lasted for several years where the government insisted that the client had committed fraud, when she had not, was wrapped up with a burst of activity from Thomas and Senior Paralegal Cyndy Ramirez, who with bulldog tenacity unraveled the truth of the case and set up the victory in court. These cases represent the best of why we do what we do. People’s lives are changed for the better and the emotional release of knowing that the immigration Sword of Damocles has been removed is a feeling every lawyer should get to know. But, be careful, that feeling is highly addictive. It is no wonder, with cases like these, that Andres Benach, Thomas Ragland and Dree Collopy were all recognized as Super Lawyers for 2013. Every year, Thompson Reuters produces its Super Lawyers list and BR lawyers have been a regular fixture on the Super Lawyers list. 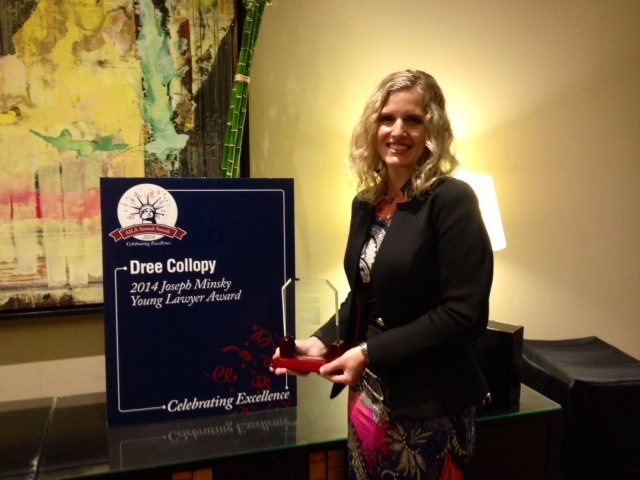 Joining Andres and Thomas this year, Dree Collopy was named a “Rising Star.” We think that Dree is already a star and that it just takes some longer to recognize it. At the same time, BR served the community. BR’s goodwill ambassadors Sandra Arboleda, Mariela Sanchez and Liana Montecinos supported the April 10 immigration rally and BR was the only law firm to attend the Maryland Council for American-Islamic Relations awards dinner on Sunday, April 28. BR even received a shout-out from Imam Johari from the Dar-el-Hijra mosque for our work on a naturalization case for one of their congregants. 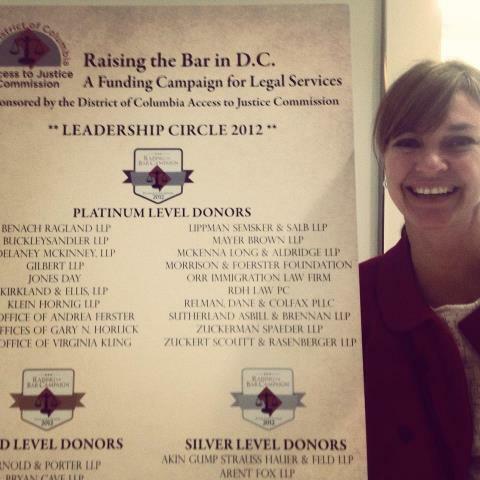 Also, last night (April 30), Benach Ragland was honored as a Platinum Member of the DC Bar’s Raising the Bar effort to support access to justice programs. Jen Cook, who has spearheaded this effort at BR, was on hand to receive the award, which was bestowed by Georgetown Law School Dean Peter Edelman who noted that Jen was once a student of his. Lastly, BR attorneys have criss-crossed the country educating lawyers on the challenges of immigration law. Thomas Ragland addressed the Upper Midwest Chapter of the American Immigration Lawyers Association. Andres Benach went to Chicago to discuss the obligations of defense counsel in advising their foreign born clients on the immigration consequences of conviction with lawyers from the American Bar Association Section of Litigation and will speak tomorrow on Provisional Waivers and also Prosecutorial Discretion at the National Immigration Project’s annual conference in Boston. Spring certainly has been busy and gratifying at Benach Ragland. May looks no different with challenging cases looming. Benach Ragland law clerk Prerna Lal will graduate from law school, marking another step towards joining BR as a lawyer after the Bar exam. It is all exciting and we are loving every minute of it. As Co-Chair of the American Bar Association (ABA) Section on Litigation’s Immigration Litigation Committee, Dree Collopy recently collaborated with immigration attorneys from across the country to develop and conduct an immigration training at the ABA 2012 Annual Meeting in Chicago, Illinois. In partnership with the ABA Commission on Immigration, Dree’s committee provided a pro bono training program designed to encourage attorneys to serve immigrants in need of a zealous advocate and to equip those attorneys with the skills they need to provide high quality, effective representation for people in removal proceedings. From August 2nd to the 7th, Chicago, Illinois was inundated with members of the American Bar Association, who congregated in “the Second City” for the ABA’s 2012 Annual Meeting. Everywhere you looked there were lawyers. Some were learning about architecture on tour boats on the Chicago River, while others marveled at the views from atop the Willis Tower (formerly Sears Tower) and shopped on Michigan Avenue and State Street “that great street.” Still more ate deep-dish pizza and Italian beef, perhaps while tapping their feet to the blues rhythm at Buddy Guy’s Legends or cheering on the Sox at U.S. Cellular Field. Amidst the city’s many attractions, however, thousands of America’s attorneys gathered to further the practice of law and the legal profession. Countless engaged in Continuing Legal Education and leadership meetings focused on strategizing another year aimed at serving the public, defending liberty, and delivering justice for all. One of the Annual Meeting’s critical goals was to develop ways in which ABA members could serve the public by providing pro bono services to underrepresented populations. At the forefront of the dialogue was the plight of the most vulnerable groups in America. Facing language barriers, increased detention, notario fraud, erosion of due process, and a lack of access to counsel, immigrants and refugees are in desperate need of skilled advocates in the fight for justice. As Co-Chair of the ABA Section on Litigation’s Immigration Litigation Committee, Dree collaborated with committed attorneys from across the country to address this very need. Together, they educated attorneys on Immigration Court procedures and assisted them in developing the skills needed to represent clients in Immigration Court. Dree and the other contributors trained attorneys on how to seek various forms of relief from removal, and opined on ethical issues that arise when representing clients in removal proceedings. Chicago Immigration Judge Giambastiani generously donated her time to provide tips from the bench, passionately affirming the need for effective representation in Immigration Court and urging attorneys to participate in defining a more just system by undertaking pro bono immigration cases. As an attorney who avidly represents this vulnerable group daily, it was inspiring for Dree to witness corporate, tax, and tort attorneys focusing their attention on addressing the pronounced need for pro bono representation for immigrants. The Immigration Litigation Committee’s programs ensured that those committed attorneys boarded their flights from Chicago equipped to zealously and effectively advocate their immigrant clients’ matters before the nation’s Immigration Courts. Dree boarded her flight from O’Hare to Washington National encouraged by the commitment of our nation’s attorneys and her Committee’s ability to further the mission of increasing pro bono immigration representation nationwide. Whether representing the single mother of two U.S. citizen children facing removal from the United States, the political activist fleeing imprisonment and torture, or the undocumented victim of years of abuse at the hands of a U.S. citizen, the dedicated attorneys who congregated in Chicago will be defending liberty and delivering justice to people in great need of skilled and trained advocates.